DARE is a national program that began in 1983 in Los Angeles, California. 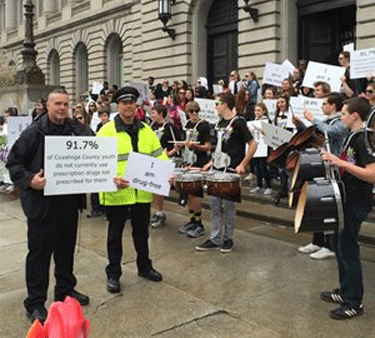 The Brecksville Police Department has been involved with DARE since 1992. DARE is a collaborative effort of the essential components of a community; students, parents, schools, law enforcement and community leaders. DARE places specially trained police officers in classrooms to deliver sophisticated, science and evidence-based curricula teaching students good decision-making skills to help them lead safe and healthy lives. DARE is instructed in every kindergarten – 5th grade classroom in the district. DARE is also taught to all 7th grade students in the district as well. Some of the topics addressed in the DARE Program include: drugs, violence, bullying, internet safety and other high risk circumstances that are part of the daily life of students. Officer Mark Kryznowek is the DARE Officer for the Brecksville Police Department. 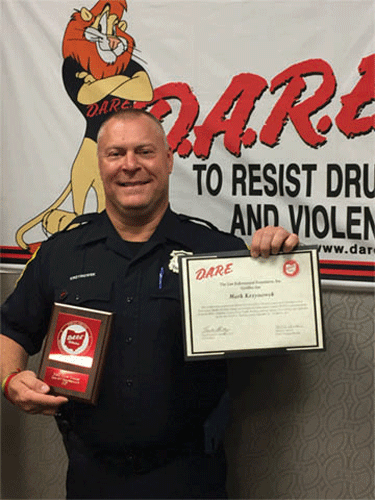 He works closely with Broadview Heights DARE Officer Jose Garcia and various staff throughout the Brecksville-Broadview Heights City School District to deliver a comprehensive and effective DARE Program. Officer Mark Kryznowek and Officer Garcia are two of a select few individuals who have the opportunity to work with the children of the Community every year as they pass from kindergarten through high school. Both officers are excellent role models for the children and are extremely committed to the youth of our community. Officer Mark Kryznowek receives his diploma.